For all fans of classic slot machines, WMS has recently released a casino game Cocktails and Diamonds slots. This is a five reel five line slot that comes with a potential jackpot of up to 1500Xs the initial bet! This is definitely aimed to attract gamblers. What strikes the eye in this casino game, too, is the return percentage. Here we have got 96.41% ration. And particularly this feature makes the game so competitive among others in the field! Cocktails and Diamonds slots has all the chic and sparkle one sees when playing a Las Vegas live casino. The graphics are quite decent yet not superior, while the background music is definitely nice. This slot machine is quite often associated with the game Fruits of Monte Carlo as they are both in the same league. The goal in this game, however, is to find the right suitor for each lady coming up during the game. Once the game starts, you will see random women appearing near the piano right above the reels in different colored dresses. Your task here is to choose the right suitor from four candidates for each woman. As it was mentioned above, you are to find the best match for every lady appearing on the display. Depending on how much she likes your choice, you may get a bonus or not. This bonus can not only multiply the current bet but also provide you with the chance to activate the double or nothing bonus. If you are sure in the suitor you have selected, it’s wise to take the bonus. This will bring you real money and much adrenaline through the gameplay. The bonus feature is the red heart. WMS is one of the oldest and best casino game developers in the industry. The foundation of this American company from Chicago dates back to 1943. Its games are mega-popular both online and in land-based casinos worldwide. It’s been seventeen years since WMS started adapting all its games for playing online. And since then, the name of the company became even more remarkable and known. 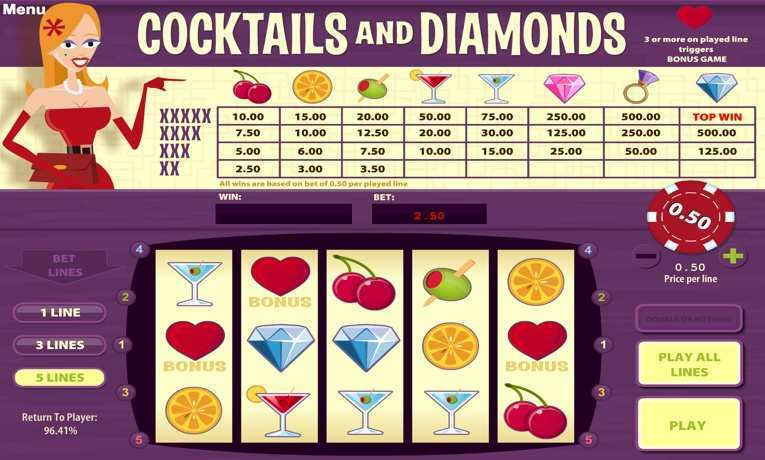 Today, to play free Cocktails and Diamonds casino slot machine no download is required. This slot machine does not have the brightest and clearest graphics, neither does it offer stunning wins. And yet, it is quite popular among those who are rather inclined to play classic slots than ultra-modern ones! Play free, make some gambling, and try winning as much as it is possible! 0 responses to "Cocktails and Diamonds Slot"